Discussion in 'Off Topic' started by Frisco, Nov 8, 2010. 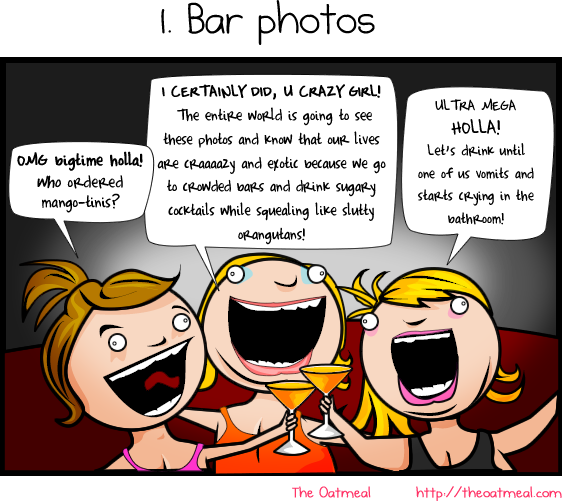 The Oatmeal came up with something timely for me; pics that should not be taken. Loud, very loud, and for hours. ..and taking pics of each other with their cell phone cameras. nitsuj17 and jamor like this. 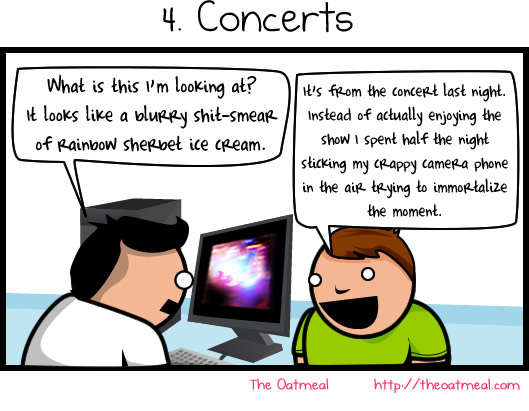 The oatmeal is always great. I run into these women way too often.. LOL!!! I'm guilty of taking food pics but it's mostly to convince other friends to give it a try. Like, if a place has fancy sushi rolls or a cool fondue spread. I don't take pics of every day cheese steaks or omelettes . I like taking pictures of scenery over pictures of people. Look through my albums on my computer, and there are very few humans in them. Mostly thngs, places and cats. On a side note, I've never seen that site before, love it! Had to stop reading the Reasons We Should Eat Horses one because I was about to make a huge laughing scene here at work! Be sure to show them this site, as well. Hey! What's wrong with scenery? Nothing. That's what I'm sayin'! I'll sometimes stand in place and wait for that half second when there is nobody in the scene before I take the pic. I just don't like taking pics of people.